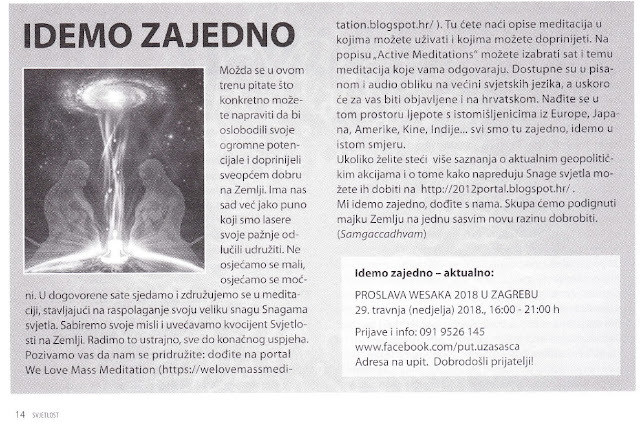 Below is an advertisement for this blog in the magazine called "Svjetlost" (Light) in Croatia. Special thanks to the great effort of the Croatian translator for this blog! You may be wondering what you can practically do to release your immense potential and contribute to the higher good of the planet Earth at this moment in time. There are so many of us who have decided to bring together our awareness of the Light and thus we do not feel weak, but powerful. At specific times, we come together to do mass meditation, putting our power at the disposal of the Light Forces. We focus on our thoughts and enhance the Grid of Light here on Earth. We are working on it enthusiastically, until the final Victory of the Light. We invite you to join us: come to the blog We Love Mass Meditation ( https://welovemassmeditation.blogspot.hr ). You will be able to find meditations you are happy to join. From the "Actve Meditations“ page of the blog you can find the time and the theme of each meditations so that you can find the ones that suit you most. Most of the meditations are available in the written and audio format in most languages and will soon be available for you in Croatian. Hopefully you can have a great time doing mass meditation with like-minded people from Europe, Japan, America, China and India, etc... We are all together here and working for the Victory of the Light! We are One, please join with us in these beautiful meditations. Together we will ascend with Mother Earth. (In the little square to the right there is an invitation for Wesak celebration in Zagreb)."